Maine Department of Transportation Travel Information Service. Maine Geoparcel View. Maine Office of GIS. Maine Turnpike and Roadway Map. Maine Turnpike Authority. Maine.gov Maps. 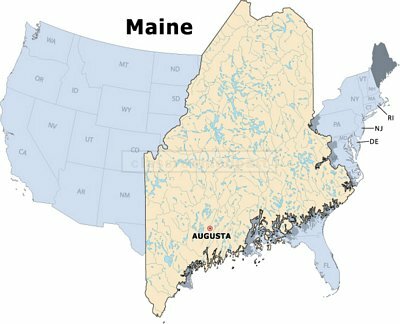 A comprehensive listing of maps about Maine from the Maine.gov website. Maps on parks, recreation, transportation, tourism, towns, counties, and more. Maine Roadway Map. Maine Turnpike Authority. Maine Interactive Tourist Map. Maine Office of Tourism. Depicts eight different regions of Maine with towns, historical sites, parks, airports, and more. Maine Map - Explore Maine by Bike. Maine's Transportation Networks. Maine Government Counties for Kids! Maine Historical Maps. From the Maine State Archives Online Store. 10,000 maps in its collections. Maine State Ferry Service Map. MEGIS Maps. Maine Geographic Information Systems. Park and Ride Maps for Maine. Maine Department of Transportation. ATV Trail Maps. Bureau of Parks & Lands. Maine Geological Survey Maps Online. Maine MEGIS Basemap. Interactive GIS map viewer. Atlantic Salmon Watersheds. Interactive mapping modules from the University of Maine. Bedrock Geologic Map of Maine. About.com. Atlas of Maine 2008. Colby College. Organic farms, Carbon Sequestration, Indian Lands, Wetlands and Development, Property Values, Clearing of Forest Habitats, Fault Lines and Earthquakes, Population Density, Electrical Service, Wildlife Habitats, Fast Food Restaurants, Woodlot Ownership, and Medium Household Income. Book Lover's Tour of Maine. Google Maps. Places where book stories take place in Maine. County Maps of Maine. Snob Hollow Designs. Geologic Maps of Maine. About.com. Habitat Maps for Map. Beginning With Habitat - a land-use and environmental organization. Historic USGS Maps of Maine. Old maps listed by town. UNH Dimond Libary. Kennebec River Rail Trail Map. Augusta, Maine. Maine Fiber Arts Tour Map. Online map showing where fiber arts crafts people are located (spinners, weavers, knitters, quilters, etc.). Maine GIS Mapping Application. By Maine State Conservation Center. Mainly Hiking. A photographic guide of Mount Katahdin. Maine Island Trail Map. Maine Island Trail Association. Maine Maps. Perry-Castaneda Library Map Collection, The University of Texas at Austin. Maine Maps. Johns Hopkins University, Applied Physics Laboratory. Maine Snowmobile Trail Maps. Maine Snowmobile Association. Map of Appalachian Trail in Maine. The Maine Appalachian Trail Land Trust. Map of Appalachian Trail - National Park Service. Provided by Fox On The Trail. Map of Maine High Peaks. The Maine Appalachian Trail Land Trust. Map of Maine Ski Areas. Maine Ski Association. Map of The Maine Wine Trail. By the Maine Wine Guild. Mount Desert Island Map by Night Sky Festival. Osher Map Library. Smith Center for Cartographic Education, University of Southern Maine. Portland Bike Trails. An Adobe Acrobat file (.pdf) ) located on the Portland Trails website. Portland Trails. Trail map of the greater Portland, Maine area. Portland Places to Play. Map of parks, trails, playgrounds, etc. (Acrobat Reader PDF file ). Satellite Images of Maine. John Hopkins University. Ski Resorts of Maine. By Ski Maine. South Portland Greenbelt Walkway. Portland Trails. Surface Geologic Map of Maine. About.com. Maps of Southern Maine Beaches. The Maine Beach Association. Southern Seacoast Watershed Interactive Maps. Wells Reserve, Seacoast Watershed Information Manager (SWIM). Average Annual Precipitation in Maine. Oregon Climate Service. Casco Bay Lines. Maps of the ferry routes from Portland, Maine to the many islands in Casco Bay. Maine State Map Collection. Geology.com. DeLorme Maps, software, GPS, and more. Located in Yarmouth, Maine. Digital Topo Maps. Topo, aerial, and many other types of maps for sale. New England Cartographics, Inc. Books and maps for hiking and skiing trails throughout New England. "Where To Find Maine Road Maps And Directions". Mapathon.com. Androscoggin County Topo Maps. topozone.com. Map of Maine Rivers. By North Country Rivers (whitewater rafting firm). Map of Maine Lighthouses. By Schooner Mary Day. Maps of Mountain Bike Rail Trails in Maine. Bikekinetix.com. Maine Illustrated. Factoids, cartoons, and lore about Maine. Meandering Maine. An interactive map of Maine for locating lodging, recreational activities and more. National Geographic TOPO! Explorer. Buy and print maps, create custom trail maps, and share your maps. Download TOPO! Explorer map editor. Map of Sebago to the Sea Trail. Proposed hiking trail from Sebago Lake to Casco Bay, Maine.